This well-written book affords the reader an unobstructed view of the inner workings of the clumsy governmental machine named the FBI. In Stalling for Time, the author permits unprecedented access to the command centers where some of the most well-known hostage incidents have occurred. 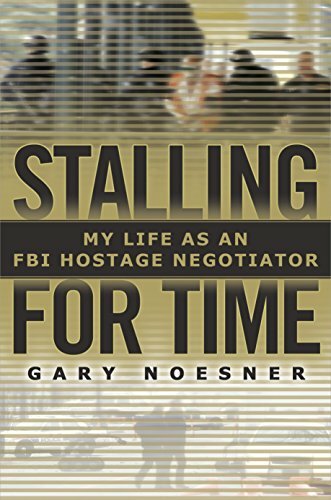 As the FBI’s former Chief of the Crisis Negotiation Unit, he takes the reader inside the heads of those who have barricaded themselves and taken hostages, exposing both the good and bad that the art of negotiation has to offer. Gary Noesner retired from the Bureau in 2003, having spent twenty-three of his thirty years as a negotiator. He details his rise from a rookie agent to the most respected authority in the fields of Hostage Negotiation and Crisis Management. His struggle was not an easy one; many of the FBI managers, in their hubris, had historically relied on force to resolve barricaded gunmen or hostage situations. Negotiation was frowned upon, particularly by agents who served as SWAT team members. Although the best-case scenario is one in which negotiators and SWAT teams work together, tactical teams have long considered negotiators to be an impediment to a resolution, rather than an aid. The premise of Stalling is to illustrate the value of time. The idea is to get the hostage taker to a point where he finally realizes he cannot attain any of his goals. When that happens, surrender is achieved well over ninety percent of the time. Noesner points out that this is one of the few techniques in law enforcement that yields a success rate that high. Time allows anger to dissipate and promotes clearer thinking on the part of the bad guy. Conversely, deadlines sometimes force poor decision-making that leads to disaster, not allowing hostage takers enough time to mull over their options. That extra time can be the difference between life and death. Stalling, although nonfiction, is an electrifying read. The author describes behind the scenes action in major events that only someone who has been a participant can supply. He gives first-hand accounts of a kidnapping and hostage-taking incident in Sperryville, Virginia; the hijacking of TWA flight 847 by Lebanese terrorists; the inmate takeover of the Talladega Federal Correctional Institution in Alabama; the inferno at the Branch Davidian compound and unsuccessful negotiations with David Koresh; and the longest siege in U.S. history with the Freemen, in Montana. These are but a few of the infamous historical events in which he had a major role. The book is replete with others. Describing the various techniques used, the chicanery employed by both sides, and delving into the mindset of a negotiator in the face of complex situations that might yield potentially catastrophic consequences make for an intriguing read. The fact that a negotiator must out-think not only the bad guy, but sometimes his own superiors as well, illustrates the stress they are under. Noesner describes the sacrifices he made, the days and months away from his family, the weekends and holidays on the road, sometimes in another country. Despite all of the hardships, the author explains his journey was well worth the herculean effort it took to re-create Bureau ideology from one that was heavy-handed and overbearing, to one that recognized the efficacy of negotiations. In fact, Noesner’s life-long work in the field resulted in the creation of a new unit, a merging of tactical operations and negotiators, and the education of not only FBI managers, but also top administrators from police departments all over the world in crisis management. While not intended to be a textbook, Stalling for Time is a book police departments would be wise to include in their libraries and academies. It’s a valuable tome, one that illustrates in simple, concise terms, the value of trained negotiators as part of any first responder team. Noesner rightly points out that not all hostage situations need end in tragedy. In fact, many of them happen spontaneously but sometimes escalate beyond the control of the hostage taker himself, most of whom don’t care to die at the hands of the police. Stalling for Time is a captivating read, proving that truth can indeed be stranger than fiction. No Hollywood movie can top this story for thrills, suspense, or action. Gary Noesner has lived the role that many in the movie industry would love to star in—kudos, sir.